Download NeoReader® direct from your mobile device! 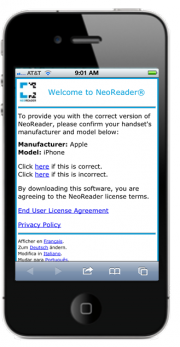 The NeoReader mobile application operates on a number of popular handsets including Apple, Motorola, Nokia, HTC, Samsung and Sony Mobile devices. Want to link to NeoReader from your website or in your next marketing campaign? Contact us to learn how!